Starbucks Card Mobile iPod Touch App. Do you have tons of apps that quiz you and let you play games or do puzzles? These apps are definitely wonderful, and help us all pass a load of time, but here’s an app that you can actually use! And you can use it every time you want to get a cup of your favorite coffee. 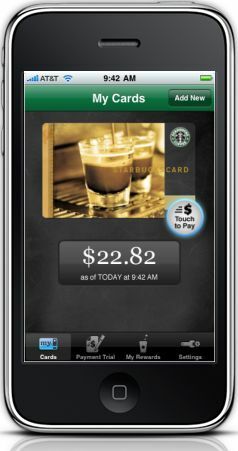 That app is the Starbucks Card Mobile, available for the iPod Touch, the iPhone, or your iPad. The Starbucks Card Mobile iPad App puts your Starbucks card right onto your iPod and iPad so you can check your balance and even add to it whenever you want. And, in select Starbucks locations, you can even use your iPod Touch or your iPhone to even pay for your coffee! The developers are currently in the works trying to find a way to make this type of mobile payment available in all Starbucks coffee shops. So download the app today and you can soon be able to purchase your coffee and your favorite Starbucks treats all right from your iPod Touch , iPad and your iPhone! But that’s not all that the Starbucks Card Mobile app for iPod touch or ipad can do. You can also look over all of your past purchase history. So if there was a special goodie or two at Starbucks that you’ve had before but can’t remember the name of it, just look it up and you’ll be able to reorder it as many times as you want, without having to go into a lengthy description with the cashier. The app is totally free to any lover of Starbucks but there are a few restrictions and limitations on it. Check out the information, and the place where you can download it here.